The Hong Kong Tourism Commission (HKTC) engaged Laservision with a brief to develop a nightly tourist attraction incorporating prominent buildings around Hong Kong’s Victoria Harbour. As tourism forms a vital part of the Hong Kong economy, the HKTC’s key objective was to drive economic development through tourism and increase the profile of Hong Kong as a must see destination in Asia. This objective was achieved through the creation and nightly running of our show the ‘Symphony of Lights’. 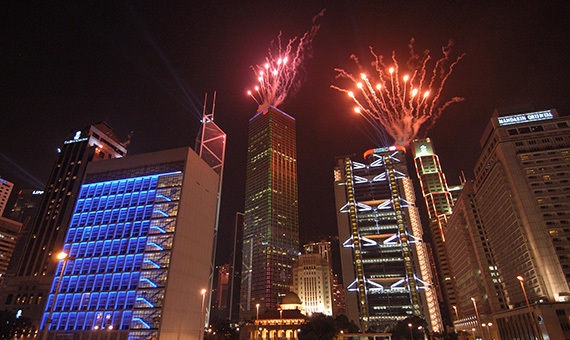 This show was conceived by Laservision in 2002 and proposed the integration of key prominent buildings around Victoria Harbour into a permanently installed, architectural, sound and laser spectacular. January 2004 saw the first of what has now grown to five stages of the Harbour Lighting Plan. This spectacular show represents an integration of architectural lighting, laser effects, search lights, original sound score and pyrotechnics into a nightly synchronised fourteen (14) minute experience. Forty-five (45) buildings around Victoria Harbour currently participate in the ‘Symphony of Lights’ show with additional buildings joining the spectacular every year. 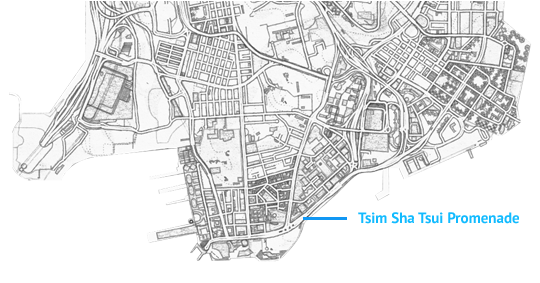 Defining the most suitable buildings in a city as overwhelming as Hong Kong was a consuming process. The Laservision team individually examined each building from a variety of angles to stimulate viewing from popular locations. The most prominent of these viewing locations is the Tsim Sha Tsui promenade which is located directly opposite the island of Hong Kong. A priority list of highly visible structures that present well was then compiled. Lastly, the form, texture, architectural merit and significance of each of the structures were then prioritised. The kaleidoscope of effects incorporated into ‘Symphony of Lights’ include over 18,000 dynamic lighting fixtures, Stella~Ray Lasers producing thousands of high powered laser beams, world class pyrotechnics and a sound simulcast which is broadcast from popular viewing locations including ferries travelling to and from the city. The simulcast can also be dialled into via mobile phone. The nightly show is programmed and coordinated via the Internet through Laservision’s Digital Data~Pump II show control systems which have been installed in all of the major buildings. Audiences enjoying the Harbour Lighting Plan will notice that some sections of the city remain dark intentionally. This only improves the impression of the buildings that are illuminated. The entire installation uses more than 17,194 lighting fixtures controlled by 28,562 channels creating ‘Symphony of Lights’ – the largest show on the Planet! Providing the technical solution for a show of this scale and complexity was tasked to the Laservision Research and Development team. The results were phenomenal, with the in house development of a hardware and software package capable of previously unattainable levels of synchronisation and reliability across large distances. Laservision “Digital~Data Pump” control system provided the technical solution to achieve this world first and set a new benchmark for large scale, outdoor multimedia, sound, light and laser spectaculars. With the increase in buildings looking to participate in the ‘Symphony of Light’ sound and laser show, Laservision’s Research and Development team continues to design, refine and develop new hardware and software solutions to cater for the ever-expanding show. 2014 saw the deployment of Laservision latest media manager solution with the installation of the Digital~Data Pump Series III control solution. 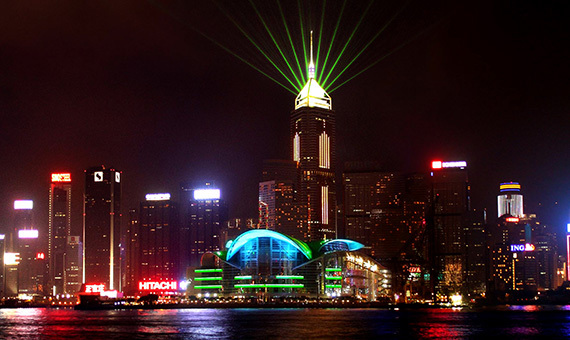 From conceptual development through to installation and deployment, Laservision’s management team worked closely with key stake holders including the Hong Kong Government, Hong Kong Tourism Board, Hong Kong Tourism Commission, and private building owners to materialise the nightly multimedia sound and laser show. Providing the client with a “Turn Key” solution, Laservision’s experienced team delivered a world class, previously unimaginable in size and scale, architectural light and laser show on-time-on-budget. Implemented in 2004, the show has undergone five separate phases of upgrades to now incorporates forty five (45) buildings located on both Hong Kong and Kowloon sides of Victoria Harbour. The 14 minute synchronised performance aims to highlight the unity of architecture within Hong Kong while educating the audience on Hong Kong’s history and cultural diversity. The flexibility of Laservision’s Digital~Data Pump show control architecture allows the show to be reprogrammed and deployed for special occasions throughout the year such as New Year’s Eve and other festive celebrations. Before the application of the Harbour Lighting Plan there were many buildings competing with each other in an uncoordinated fashion that ultimately led to overwhelming cases of light pollution. ‘Symphony of Lights’ has solved much of the light pollution and represents a tourist attraction that will astound both young and old. In 2002, Laservision established a branch office in Hong Kong to support the implementation and ongoing maintenance and operation of the nightly show. An experienced technical team provides the Hong Kong Government and private building owners with local support, preventative maintenance and repair and replacement services. The ongoing support provided by Laservision has maintained the integrity of the show and can be attributed to the success of the spectacular as it enters its eleventh (11th) year of operation.